Two months after Instacart announced it would ditch tips in favor of a “service charge,” and weeks after the company appeared to reverse course, declaring it would keep both the new sharable service charge and an option to tip on all orders, the change has officially gone into effect nationally, and some Instacart shoppers say the change has only resulted in confused customers and fewer tips. When Instacart announced the initial change back in September, it said the move was to make Instacart drivers and shoppers less reliant on tips from customers, as some 20% of users were not allocating a worthwhile tip on their orders. The workers’ base pay would be bumped up and customers would have the option of choosing a “service amount,” but instead of that money going directly to the drivers and shoppers that had done the legwork on an order, it would be pooled and used to help cover the increased base pay. There were also promises for periodic bonuses based on customer feedback. Weeks later — after backlash from shoppers — when the company announced it had decided to move forward with both the service amount and the tip option, shoppers expressed concern that the new system would be confusing for customers. The new service amount and voluntary tipping option first showed up on Oct. 17 for Instacart users in San Francisco and Washington, D.C. The rest of the country will see it on Oct. 24. Now, after at least one week of use, many shoppers tells Consumerist that the plan, while first seen as a compromise of sorts, has caused more headaches than help. “The change has been a disaster,” shopper Stacy tells Consumerist, noting that the issues have typically manifested in three ways: confusion with customers, a lack of hours for some workers, and lower pay for most. When Instacart announced it would keep both its new “service amount” — which shows up as a 10% charge at checkout by default — and a tipping option — set to $0 by default — some shoppers immediately questioned how the company would present the options to customers. “Many people will wonder, what is a service amount if not a tip? Am I supposed to tip twice? Is the service worth using with all these extra charges?” shopper Kevin told Consumerist at the time. To answer those questions, we headed to the Instacart app. Once an order is nearly complete and a customer reaches the checkout screen, they’ll notice a line item that reads “Service (10%)” with a link to “Change” that amount. Below the service amount area, customers will see a spot noted “additional tip.” The box notes that “additional tipping is optional. 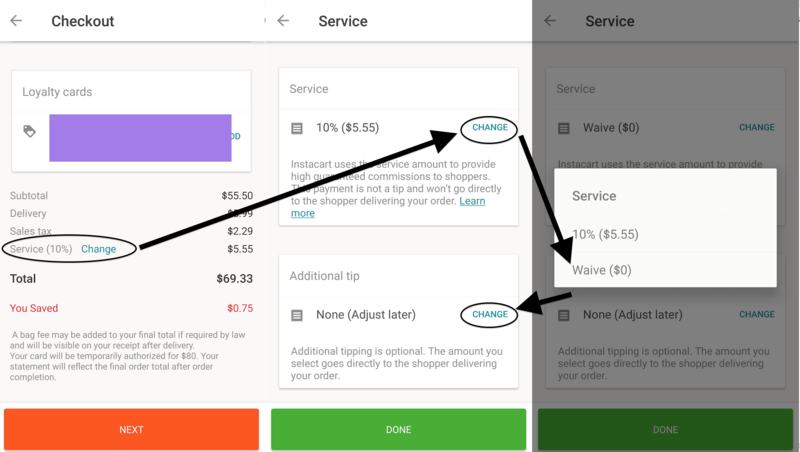 The amount you select goes directly to the shopper delivering your order.”Customers who choose to change the amount will then see a pop-up showing what the 10% calculates to, or the option to waive the amount. The tipping option is set to a default of $0 and can be adjusted after the delivery. The “Learn More” section explains that tipping a driver is optional, but that the entire amount selected goes to the shoppers. While the company appears to have taken steps to describe the service amount, some shoppers say the way this fee is presented is misleading to customers. “They are confusing the customer purposefully and making it hard for them to tip,” shopper Angie tells Consumerist, adding that in the first week the change hit her city she had only received one tip. Matthew, a shopper in Chicago, says that cramming all of the information into the app is a disservice to both customers and shoppers. “Basically the verbiage is there, they (customers) could read it if they clicked, but again this is an app service, people are paying for the convenience,” he tells Consumerist, noting that many of his customers aren’t aware of what the changes actually mean. Instead, Matthew says that he generally spends about 10 minutes on each delivery explaining the change to customers who ask. In most cases, Matthew says that once customers realize what the change means, they’re upset. “It’s infuriating. At the end of the day they are basically tricking people to pay two or three-times more for the service fee and not the shopper,” he says. Shopper Ken in Los Angeles tell Consumerist that he’s also encountered confused customers since the change took place in his city last week. Several of the Instacart shoppers Consumerist spoke with believe that the confusion surrounding the changes and the way the tip and service amount are presented have resulted in significant decreases in their pay. San Francisco-based shopper Gabby sent Consumerist screenshots of her recent pay over three weeks: the week before the change took place, the week it took effect, and the following week. While Gabby worked different hours each day, the change from $60 in tips to $13 and then $0 shows the difference in what shoppers receive when comparing previous tips, with the new service charge — shown as “other.” Gabby also believes the differences show the disconnect between how information about the changes have been passed along to customers. Gabby’s pay recap shows that tips have significantly dwindled after the change. “Why should shoppers deliver groceries to the residents and companies in the most expensive city, and not able to make enough to put food in our own kitchens at home?” she asked, noting that she has driven for the company for two years. Monica, a shopper in the Austin area, tells Consumerist that on a normal Monday she would make $25/hour, but on Oct. 24, when the change hit her area, she made just $8/hour. “I informed my customers yesterday about the new service fee and that it’s not a tip and they were upset that Instacart would do that,” she says. Karen shared a similar story, estimating that her take-home pay has been cut in half since the change took effect. “This ‘guaranteed higher pay per delivery’ is a JOKE, tips were nearly half my income, they raised the delivery commission but lowered the item commission, so the difference is literally pennies per order, and depending on the amount of items, a shopper could actually make less money now on a delivery alone,” she says. The commission price per item is one way in which Instacart figures the pay for drivers and shoppers. Each item on an order is given a price — for example, $0.05 — but if there is more than one of a product selected — like five boxes of mac ’n cheese — that commission is only counted once. So, theoretically, you could fulfill an order for 10 cases of soda at $0.10 per item and only receive a $0.10 commission. Ken, the shopper from L.A., tells Consumerist that while he reserved criticism of the new system until it launched, he now believes it’s a disaster. He says he’s down 40% in wages over first week of the change. On one day he made $15/hour versus his typical $25/hour, and the next day averaged just $11/hour. “The tips used to compensate us for long drive times or slow periods where we wouldn’t have a lot of orders back-to-back, but now that we are completely reliant on our commissions to make all of our money, it’s lowering the earnings substantially. And we have to pay for gas, maintenance, repairs, etc. on our vehicles which is a huge expense,” he says. Chicago shopper Matthew tells Consumerist that in order to make up for the pay system changes, he’s been forced to work seven days a week. “I used to have a few days off, but in order to make the same amount I did before the change, I’m working all week,” he says. Emma, a shopper in Oregon, tells Consumerist that her experience with the change has meant working twice as hard and long as before. But working more hours to make up for the lost income isn’t an option for all shoppers. Angie notes that because Instacart changed the way in which hours are doled out — giving priority to shoppers who work the most — many are stuck with shifts that attract few orders. We’ve reached out to Instacart about the confusion and issues that shoppers have encountered. We’ll update this post when we hear back.